Experts claim we need eight hugs a day to be happy. Get one that lasts all day with the Rachel. 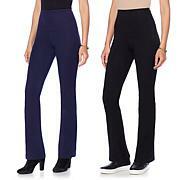 This comfy legging is made from a compact cotton blend that provides allover smoothing with 360-degree compression. Plus it features Yummie's signature hourglass waistband to help create a curvy silhouette. Go from sofa to street in these versatile leggings. Idk why there are 2 order #s on the "Rachel"? I ordered 4 pr as I live in the 8-10 pr I bought a few yrs back. Issue is these r larger thru the leg than previous ones. I'm hoping they hv the colors when I return for a size down. At 5'4" 135 lbs, I wear a small in other brands. My old Yummie are a LG but fit great. These were too lg to hv any compression on my skinny legs! I'm hoping they hv my colors when I rtn for a medium. Great material, awesome waist shaper! This is the second time I have purchased these leggings. I have bought them in various colors. Within 2 weeks of wearing them they already have holes. I have not had any problems with the previous leggings at all. These are not cheap leggings and I expect better quality than this. Absolutely not satisfied with my purchase.